How To Get Confidence as a Beginning Singer! Over many years as both performer and a vocal coach, I have found that sustainable confidence comes from a variety of sources. On this page, I will offer a number of resources that should help the beginning singer, especially - no matter your age - grow into greater confidence. 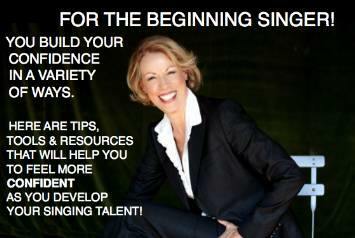 Some of these resources are written vocal guides that I have created especially for singers who are starting out. They can be purchased in my Singer's Gift Shop. Others are written, audio and video items that are free on the net. In addition, you can also use the google search box below to look for your chosen subjects: auditions, sore throat, confidence, self esteem, high notes, careers in music, & more... Just enter your area of interest & voila! FREE! How to get confidence with resources that boost your singing technique! I have created 9 short videos that deal with various technical problems and challenges. The first two are especially good for beginning singers. #1 - Soothe Your Vocal Cords! is a great place to start! For those days when you wake up with a raspy voice that doesn't feel good. Perhaps you have sung too much the night before... Here's the long-held "Nooo" exercise. #2 - Develop Better Vocal Control! will teach you a the simple exercise, "EE AY AH OH OO" - that helps you gain control of your voice. - How to sing! 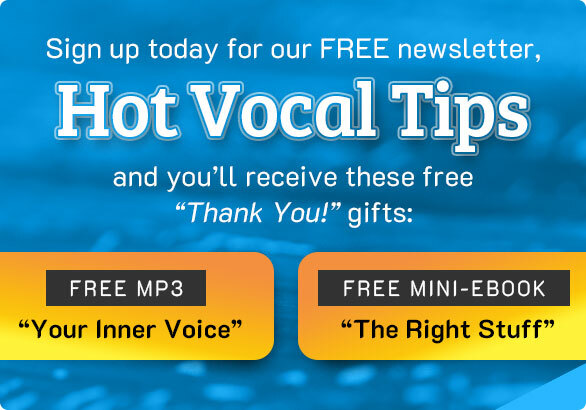 The guide contains INSIDER'S AUDITION TIPS and many other useful tips about how to keep your voice healthy, how to breathe well, how to practice and how to find good songs for your voice. - Stage Fright - 12 Powerful Tools to Help You Beat It! - This is an easily downloadable PDF file that contains 35 pages of information that focus on the specific interests and problems of singers. - Beginning Singer's Tool kit - This kit contains a combination of tools (written, audio/video plus a private lesson package) that can give a beginning singer a great boost of confidence and pleasure. How to get confidence with expert singing lessons and friendly consultations! - Ask Barbara questions - For those singers who do not want to take a lesson, here is an opportunity to simply ask Barbara questions about your singing that will help in your vocal development or help you to solve an ongoing problem. - "Get to Know You!" Lesson- Barbara offers one half-hour lesson at the special price of $25.00 as an introduction to Skype singing lessons. This offer is valid only for a "first" skype lesson so that prospective students can see how a lesson works with Skype. - Trio Singing Lesson Package - three fun and friendly lessons to get you started right! FREE! How to get confidence using warm up routines that I use myself every day. Free audio singing exercises. - A Guided Breathing Exercise - For those of you who like to be guided through an exercise, here is a good way to warm up your body and your mind before you begin your singing practice in earnest…. Guiding You to A Strong Breath and a Composed Body (4:17). Singing resources for all ages & styles. Have a look!